But the generals warned they would not tolerate "chaos" and ruled out extraditing Omar Bashir, the dictator they deposed in a coup, to face charges of war crimes. "We are not against the demands of the people, we are for the demands of the people, and we have to achieve them," said Zein Abedeen, the general tasked with leading talks with the protesters. "We have to adhere to civilised methods and today we will start a dialogue with the political groups, who are invited to hear from us what we have in mind and what they have in mind." 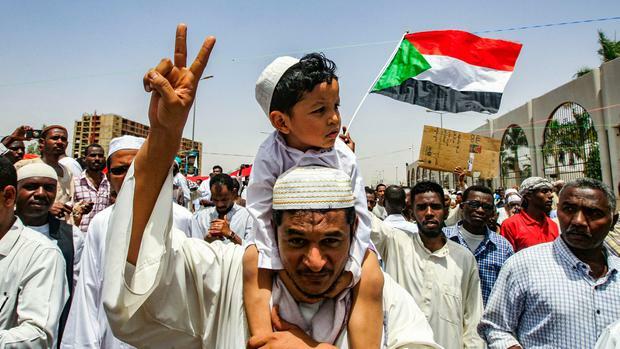 The Sudanese Professionals Association, which has led months of huge anti-government protests, said the "coup makers are not eligible" to oversee change and demanded an immediate hand-over to a civilian government. Their comments followed Sudan's defence minister announcing he was stepping down as transitional leader. In the morning, protests continued, with festive demonstrators shouting "down with military rule" and parading an enormous Sudanese flag.